My red laser dob collimator batteries died on me in the fields, along with their spares. So, I've rigged this convenient harness in 5 minutes in red light. The image is selfexplanatory, but see details under the cut. 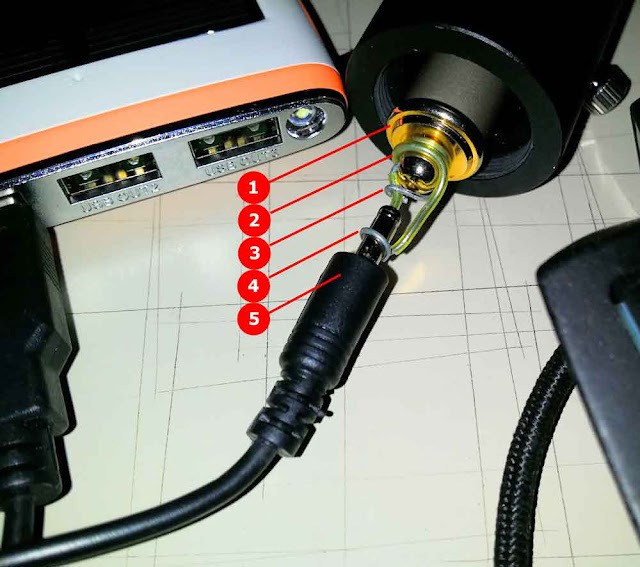 The only modification of the laser pointer inside the stock Zhumel laser collimator is the small hole in its battery compartment's screw cap for the negative wire. hand drill (awl, exacto, pin wise combo tool); any drill for small bits would work. Internal laser pointer's battery compartment screw top, with 2 mm negative wire's hole drilled off-center orthogonal to the the lid for the positive contact wire. the negative wire coming from the hole in the laser pointer's battery compartment screw top (1) and around its lanyard post for security, also tightening the positive wire rocking contact loop (3) in the hole on the side of the lanyard post. On the inner end of that wire I've made a V shaped loop reliably sticking inside the negative battery contact's spring of the pointer. the positive wire rocking contact loop, going through the existing side hole in the lanyard post, tightened by the negative wire (2), it's coming out through the hole, around the lanyard post's top, and into the positive socket of the USB cable's barrel connector (5) (added a couple of waves into that improvised central pin for a real snug fit, as that wire is too thin as is, and too thick if two-fold). negative wire contact loop around the negative outer sleeve of the USB cable's barrel connector (5). Works fantastic and can be converted back to the battery operated by unbending and removing the wires (a must - to avoid short-circuit). Can be stored under the stock tail screw cover of the collimator when the laser pointer's screw top lid is removed and reversed (adapter goes inside the laser pointer). Most likely I'll keep it as a permanent solution, as that powerbank is always with me. Goodbye tab batteries.